For things to do with the family, here are five kid-friendly dates with fun this winter in Chicago. The Maggie Daley Park Ice Skating Ribbon is one of the best spots in the city to skate a figure eight, and the railing that lines the loop is the perfect pick-me-up for wobbly skaters. Open thru early March 2017, admission is always free with skate rentals running $12. Check into the Mag Mile&apos;s Hotel InterContinental this winter and mention the Maggie Daley ice skating experience and you&apos;ll receive a pass for two people that includes two VIP Skip-the-Line Passes to Maggie Daley Ice-Skating Ribbon, two skate rentals, two lockers and two hot cocoas. Celebrate friendship this January with a sweet cupcake from Sprinkles, one of Chicago&apos;s best cupcakeries. January 5–25, Sprinkles Cupcakes will offer limited-edition Care Bears cupcakes to celebrate the Care Bears 35th Anniversary and National Hug Day on January 21. In addition to limited-edition Care Bears cupcakes, whisper words will be revealed weekly on the Care Bears and Sprinkles Instagram pages with instructions for fans to redeem freebies and special goodies at check out: Follow #SprinkledWithCare on Instagram. The Art Institute of Chicago has an amazing array of Family Workshops on the menu of fun this wintertime. From Artful Play for the littlest ones in the family (ages 3–5 with caregivers) to Tween Workshops for families with kids ages 9–12, there&apos;s a class for every creative kid. 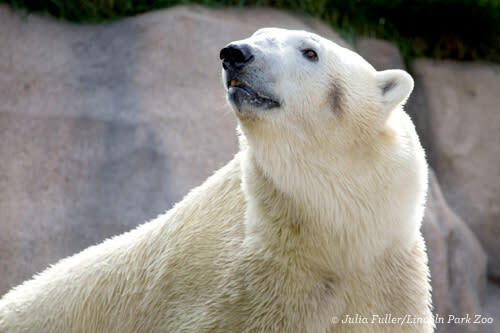 Lincoln Park Zoo&apos;s polar bears bring their playful winter spirit to Chicago this winter thanks to the newly inaugurated Walter Family Arctic Tundra. At 11,483 square feet, this exhibit features a winding stream, a waterfall and pools, as well as digging areas, a commercial ice machine and a behind-the-scenes denning area to accommodate potential cubs. Four immersive viewing areas include an underwater area, an ice-cave area with a tactile ice wall and air-cooling mechanism and a 10-square-foot training wall give guests the chance to witness keepers interacting with the bears. See more than 25 trains make the journey from Chicago to Seattle in the Great Train Story this winter the Museum of Science and Industry. Or shake off cabin fever with a run inside a human-sized hamster wheel. Climb aboard a massive tractor and follow the fascinating journey of food and how it travels from the farm to your table. Peek inside the whimsical Colleen Moore&apos;s Fairy Castle, complete with a pair of Cinderella&apos;s tiny glass slippers. Experiment with light to create a giant 30-foot rainbow. MSI Chicago is offering FREE museum entry to Illinois residents on select dates each week in January and February, starting January 10, 2017. Check out dates and details. PLUS: On January 16, Martin Luther King Jr. Day and a free day for Illinois residents, MSI will launch its annual Black Creativity program with a special Family Day. Explore the grand opening of the Juried Art Exhibition, which features more than 100 works of art from African-American artists. It&apos;s the longest-running exhibition of African-American art, with works being displayed at MSI annually since 1970. For more details on all these programs, visit msichicago.org/blackcreativity.